Bison are North America's largest mammal. 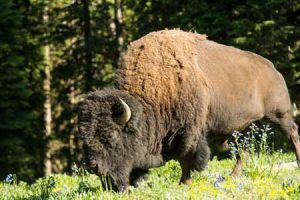 On May 9, 2016 President Barack Obama signed the National Bison Legacy Act specifying the bison as the national mammal of the United States. Approximately 400,000 years ago bison crossed the land bridge from Asia to North America where they thrived and ranged from Mexico to Alaska. They were an important part of Native American culture. Then in the 1800's the bison herds of North America were hunted almost to extinction. At one point, there were less than 1000 bison left. Due to strict conservation efforts started by President Theodore Roosevelt, the bison has seen a tremendous comeback. Today bison live in all 50 states. There are nearly 30,000 wild bison and over half a million bison on ranches and Indian reservations. Bison have always thrived in Yellowstone National Park. 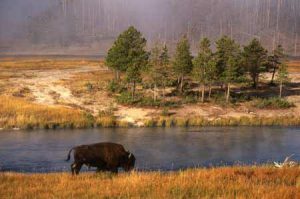 Yellowstone is the only place where bison have continuously lived since prehistoric times. 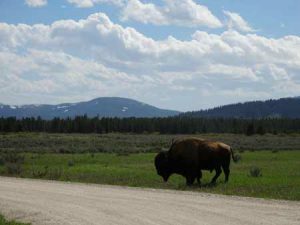 Head to the Park from Big Sky and you'll likely see these majestic creatures in West Yellowstone (they sometimes sleep in the road) or inside Yellowstone's boundaries. The scientific name for these even-toed ungulates is Bison bison bison. Bulls can weigh up to 2000 pounds and stand 6 feet tall. Cows weigh up to 1000 pounds and stand 4 to 5 feet tall. Bison calves weigh 30 to 70 pounds at birth! Bison can be hunted in Montana from November to February. Bison live 10 to 20 years. Bison can run up to 35 MPH. Cows breed at age 2 and have one calf at a time. After a nine month pregnancy, calves are born late March through May. They are called "red dogs" because of their orange-red hair. 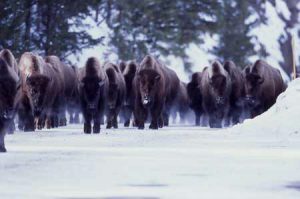 A group of bison is called a herd. A bison's thick coat insulates and protects their bodies. Bison are herbivores. They eat about 9-11 hours per day. The bison's muscular hump allows them to clear snow to create foraging patches in winter. Bison "wallow" in the dirt to shed fur, discourage flies, leave their scent, and display strength. Bison express their mood through their tail. If it's standing straight up they may be about to charge! Bison can jump up to 6 feet! Approximately 4,900 bison live in Yellowstone. Bison fight by crashing their heads into each other and using their horns. Their short, curved, black horns can grow up to 2 feet long. The National Bison Range is located near the Mission Mountain Range of Montana. Our national mammal may look cute and cuddly, but it is a wild animal. Always give them space. Bison can charge and gore people. Don't pet them or try to ride them. And please don't take selfies with bison either.